The “Flounder Bowl” is back. This year’s tournament is scheduled for June 27 with a captains meeting June 26. The tournament will be capped at 120 boats again this year. Online registration is available and encouraged at www.flounderbowl.com . Both anglers and sponsors can join at the Flounder Bowl website. This event is a two-day party with a fishing tournament on the side. The Flounder Bowl is hosted by the Peninsula Salt Water Sport Fisherman’s Association but it is the many businesses that sponsor this event which make it such a great time. These businesses are providing a guaranteed First Place award of $5,000. They also make it possible to provide food, drink and music for participants at both the captains meeting and at the weigh-in. The sponsors provide for team buckets given out at the captains meeting and they are also providing various prizes which will be given away at the weigh-in. Each team will find door-prize tickets in their team buckets which will give them chances to win these prizes. The Flounder Bowl will be held out of Dare Marina and Yacht Sales (www.daremarina.com). Boats will be allowed to fish from any port but the fish must be brought to Dare Marina for weigh-in. This is a team tournament with an entry fee of $200 per boat with up to 4 anglers ($125 early entry). Additional anglers will cost $25 each. Winners will be determined by the combined weight of the team’s top three fish. Cash prizes will be paid through six places. To give everyone a chance to win, teams not placing in the top six will be entered in a “Lucky Dog” drawing. The team drawn will win an additional cash prize. There will be a prize for the heaviest flounder caught by a child and a prize for the heaviest flounder caught by a woman in the tournament. There will also be a prize for the heaviest flounder weighed in by a member of the Peninsula Salt Water Sport Fisherman’s Association. Teams will be given the option of entering a “Big Fish Calcutta” for an additional $100 entry fee. The winner is the team that has entered the Calcutta, which weighs in the single heaviest flounder. There will be a second optional “Stringer Calcutta” with a $100 entry fee. The winner is the team that has entered this Calcutta, which has the heaviest stringer weight. There is a special Sponsors’ Challenge Division where teams entered by the tournament sponsors will compete with each other for the special Sponsors’ Trophy. The winning sponsor will get to keep this trophy until next year’s tournament. Currently, the Sponsors’ Trophy is in the possession of M & M Custom Painting. 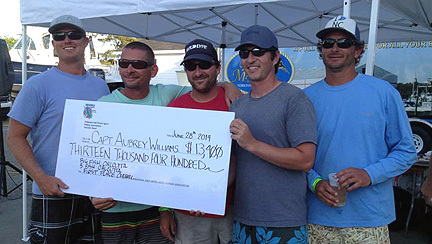 The 2014 Flounder Bowl had a total cash payout of $19,850 plus sponsor donated merchandise prizes. The winnings are expected to be larger this year. This is your chance to fish with and against some of the best flounder anglers in the state. There will be food, drink, music, and multiple chances to win. Come on out and join the fun! You can find the Flounder Bowl on Facebook and visit www.pswsfa.com and www.flounderbowl.com . Sponsor support for this event is nothing short of fantastic! These businesses are going out of their way to make sure that the local fishing community has a good time. We encourage Flounder Bowl participants to support the sponsors who make this event possible. Generous sponsor support has allowed the Flounder Bowl to support various worthy causes. Flounder Bowl proceeds have been used to make donations to the Children’s Hospital of the King’s Daughters, the CCA, RFA, Children’s Fishing Clinic, Salem United Methodist Church Wickel Food Pantry, and to local families in need. If you are interested in becoming a Flounder Bowl Sponsor, contact Nelson Ortiz: (757) 812-0769 or email at flounderbowl@verizon.net . You can register as a sponsor at www.flounderbowl.com . Sponsorship levels are: Silver at $250, Gold at $500, and Platinum at $1,000.